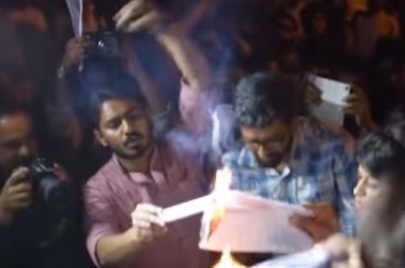 The Akhil Bhartiya Vidyarthi Parishad (ABVP) members and ex-members burnt Manusmriti, the ancient text on Hindu law, on the Jawaharlal Nehru University (JNU) campus. The programme was organised on the occasion of International Women's Day. The event was held despite the University not giving its permission to burn the text. Parishad's members and ex-members were present. ABVP's JNU unit vice-president Jatin Goraih led the event. ABVP is the students wing of the Rashtriya Swayamsevak Sangh (RSS). Though the ABVP members are being termed rebels for their stand over the JNU row, two of these five members haven't resigned and are still with the outfit. The pages of the text containing 'controversial, anti-women and casteist references' were burnt. Pradeep Narwal, who has resigned from the ABVP, read out 40 points from the text before the pages were burnt for derogatory references towards Dalits and women. The students raised slogans against Manuwad and Brahmanvad. Chanting 'Jai Bhim', they also spoke against casteism and caste-based discrimation in the Indian society. The event was organised on Tuesday evening at the Sabarmati Dhaba at JNU.